It ended with a simple trip. 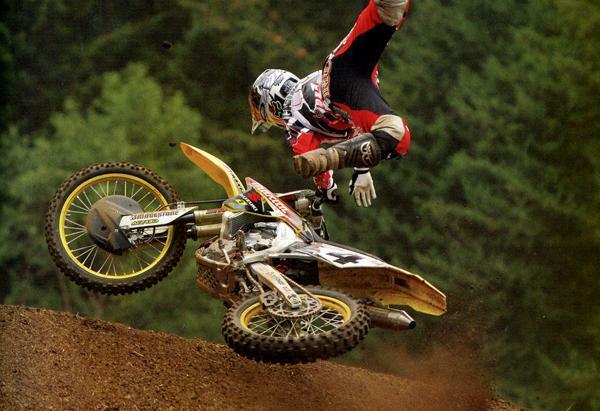 Ricky Carmichael, the Suzuki factory rider who had not lost an outdoor national since July 2003 holeshot the first moto of the first national of 2006 at Hangtown, seemed to trip over the chalk line and promptly crashed all by himself when he started out front! Carmichael, who had last lost an outdoor overall to Kevin Windham way back at Washougal '03, back when he was on a two-stroke Honda CR250 and Windhham was still getting used to his CRF450, went from first to last faster than you can say “holeshot bonus!” He battled back hard, all the way from last to third, but by the time he caught James Stewart, the leader on his factory Kawasaki, Carmichael was out of tear-offs. 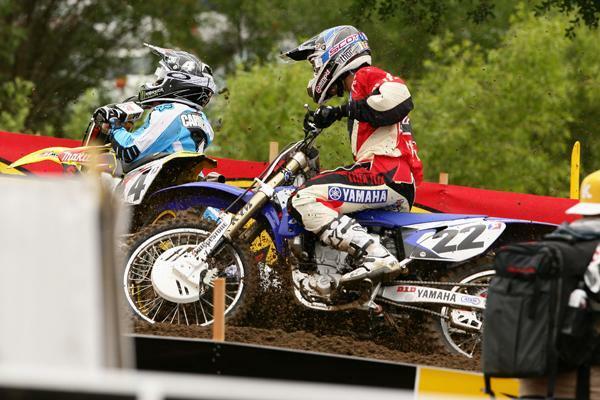 Together they caught Yamaha rider Chad Reed on the very last lap, and Stewart found his way around for what was the first 450 AMA Motocross moto win of his career, while Carmichael could not get past Reed. The second moto marked history, because while Ricky just plain took off with the win, that third-place finish in the first moto, combined with Stewie's runner-up ride, gave Carmichael his first outdoor overall loss in nearly three years. It also gave Stewart, the all-time best 125cc rider AMA Motocross and AMA Supercross history, his first outdoor win on a big bike. Carmichael would crash again at Southwick, losing a moto there to Stewart but not the overall. And then he absolutely, incredibly threw it away all by himself on the big infield jump at Washougal, throwing a sure overall win away and going into a rage like we haven't seen the once-hot-tempered Carmichael go into for some years. The crash photo was caught by our longtime contributor Tony Scavo, and it's certainly one of the lowlights in RC's otherwise ridiculous motocross reign. Finally, at the end of his full-time career—his last national as a pure motorcycle racer—Carmichael was leading at Glen Helen and crashed in the first moto, injuring his shoulder and pulling out of the race with no points for the one and only time in his entire career. The recipient of the win there? Stewart again—third time, in fact. RC didn't need the points though, as he had already clinched the title. Again. Add it all up, and Carmichael won his tenth AMA Motocross title in ten consecutive years, clinching all ten before the last round. That surely ranks as the most unbreakable record in the entire sport. He also won his fifth and final AMA Supercross title that year, edging out Stewart and Reed in one of the sport's all-time great title bouts. All told, Ricky won 15 major titles in AMA Supercross and AMA Motocross—almost twice as many as the next closest champion in the books! 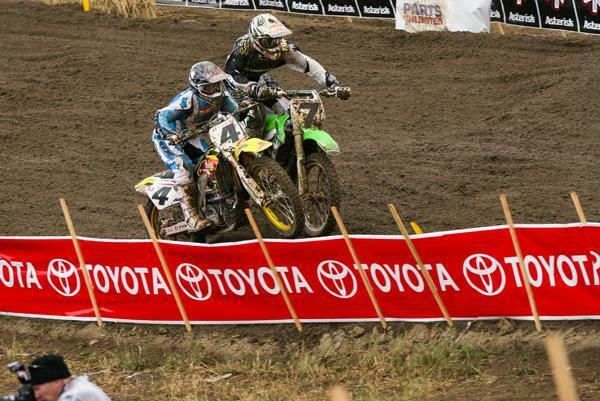 In the 250 class, many had pegged Mike Alessi to be the man to beat following the unfortunate ending of the previous season's title chase at Glen Helen (see 2005). The KTM-mounted Alessi started out strong, going 1-1 at Hangtown on the #800, with a slew of blue behind him: Yamaha of Troy teammates Brett Metcalfe and the late Andrew McFarlane. But not far off the pace was the #51 of Monster Energy/Pro Circuit Kawasaki rider Ryan Villopoto, who was in his first full season on the tour. And at the second round of the series, which was the High Point National, Alessi won the first moto, giving many the impression that he was going to run off and hide with the points lead. But then Villopoto, who hails from Poulsbo, Washington, absolutely caught fire. He won the second moto and the overall at High Point, and basically took over the class. While riders like Alessi and Team Honda's Andrew Short, or Team Suzuki's Broc Hepler (who missed the first half of the season with an injury) would come along to gather wins, it was Villopoto who eased away from everyone for the title with strong, consistent finishes. 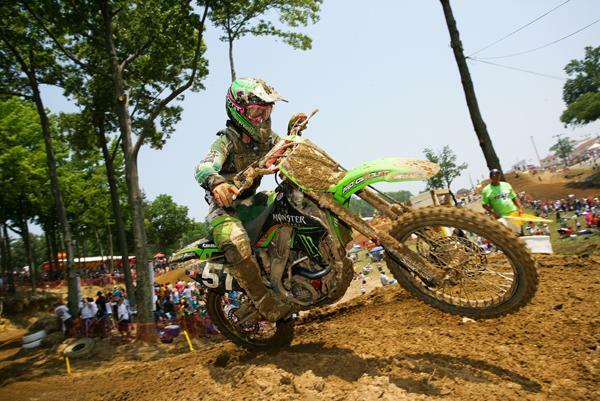 It was the beginning of a dynasty of sorts in the class, as Villopoto would win his first of three AMA Motocross titles in the 250 class. Meanwhile, Stewart was poised to take over the reins of the world's preeminent motocross rider, but no one told that other King of Motocross, the great Belgian hero Stefan Everts. Having planned to end his career with one last battle with Carmichael at the 2006 Motocross of Nations at Matterley Basin in England, Everts was disappointed to hear that Carmichael had to scratch due to his should injury. He would be replaced by his Suzuki teammate Ivan Tedesco, with Stewart on the 450 (MX1) and Villopoto on the 250 (MX3). In what seemed an upset to many on this side of the Atlantic Ocean to be an epic upset, Everts simply outclassed Stewart in both motos together. While James helped lead Team USA to another win, it was Stefan Everts who rode off the stage as the hero of the day.